Besides looking at the aforementioned blogs for inspiration, there’s a great chapter on shirt jackets, with associated online material in David Page Coffin’s book, The Shirtmaking Workbook. He has a Pinterest board with lots of design inspiration, and I have also started my own Pinterest inspiration board for the project. This project is both a learning exercise and an experiment for me, so I’m not devoting precious fabrics to the project. 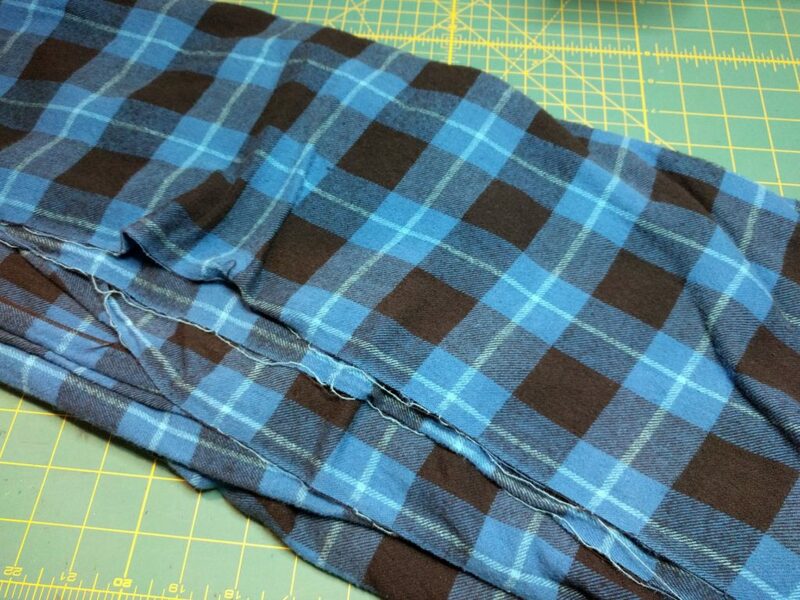 This cut of blue plaid cotton flannel is from my dwindling stash of fabrics from JoAnn’s. I’m trying to destash, and assuming I have enough fabric in this cut, should work great for this project. (I bought enough to make a shirt, but I may not have taken plaid matching sufficiently into account. And a jacket pattern is a bit larger than a shirt). 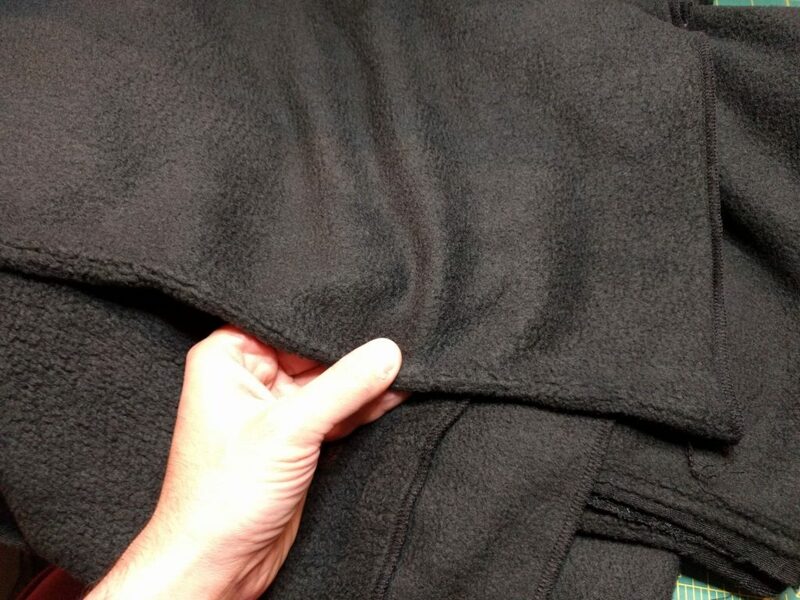 For interlining to make the jacket warm, I went back to JoAnn’s and bought this cut of black polyester fleece. If there’s one thing JoAnn’s is good for, it’s buying fleece. You almost even have to search to find their quilting fabrics in amongst all the fleece. 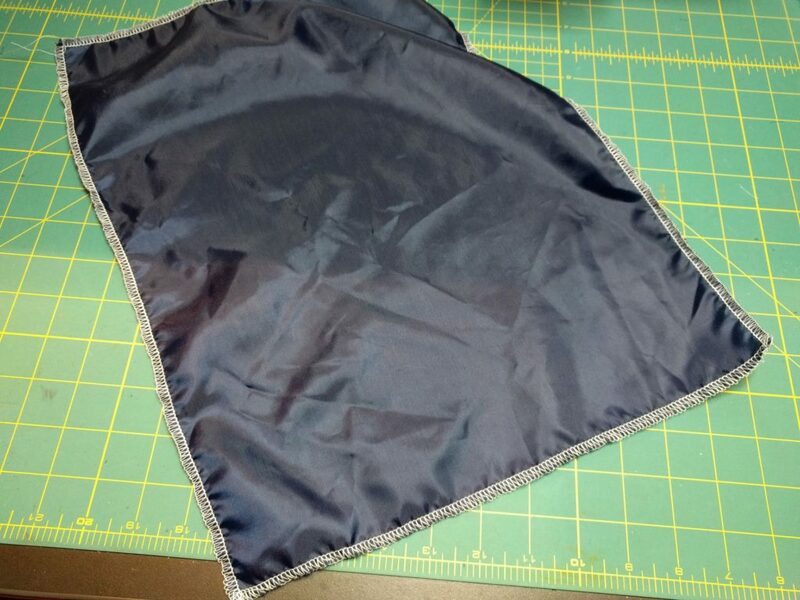 And finally, for the lining fabric I’m going with this piece of navy blue polyester satin. I bought a ton of it from Fabric Outlet when I very first started sewing. I used it to line a laptop sleeve, and the excess has been sitting in my stash ever since. The photo shows a scrap piece, I’m pretty sure I have enough to make a lining. Being true to character, instead of making things easy I’m going to draft my own pattern for the project. My plan is to take the dress shirt pattern I poured so much effort into, and to use it as a starting point for developing a jacket block. 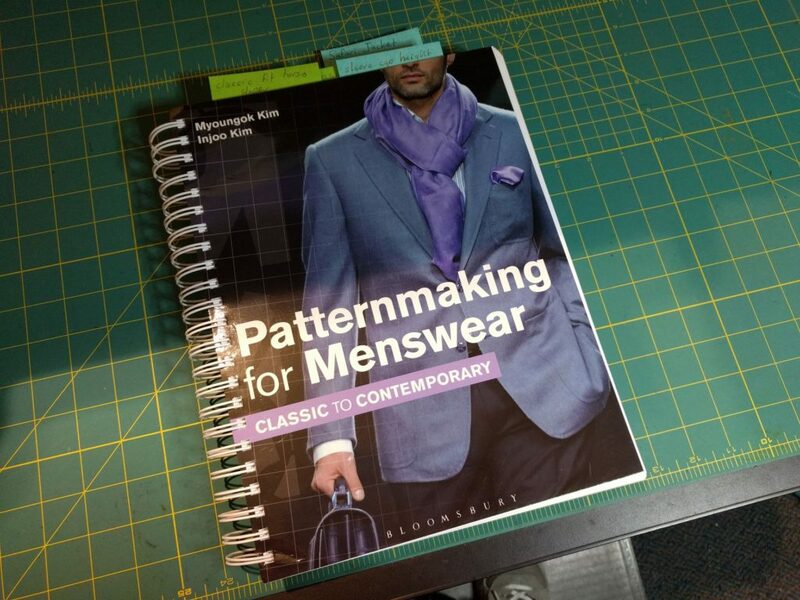 For my guidance, I am following the book Patternmaking for Menswear: Classic to Contemporary by Myoungok Kim and Injoo Kim. This is a professional book aimed at fashion design students. It has a good mix of technical knowledge along with coverage of many different styles of garments and details. The book has a draft for a classic-fit Safari Jacket which I’m using as rough guide for the kind of garment I want to make. I’m going with it’s instructions for the silhouette. All of the detailing on my shacket will be different (more on this in a moment). Before drafting the Safari Jacket pattern, you first draft a foundation block for jacket designs, using either a slim-fit or classic-fit torso sloper as a starting point. I am pretending my dress shirt pattern is a classic-fit torso sloper, and am altering the pattern according to the draft in the book. All of these enlarge the garment to make it fit over over other clothing. Here’s a screenshot from Wild Ginger’s Pattern Editor showing the changes I’m making. The black outlines are the original dress shirt pattern. The teal lines are the jacket foundation block. (The green lines square off the original dress shirt for comparison). I rotated the shirt yoke into place to make the alterations to the back piece; I intend to retain the yoke in the shirtjacket pattern. To make the sleeve, instead of altering my existing dress shirt sleeve I drafted a new one from scratch using the instructions given in the textbook. This was the first time I drafted something from scratch on the computer, rather than scanning in a pattern draft from paper and altering it digitally. It might be me, but I had to resort to math on paper (including some algebra and an application of the Pythagorean Theorem) in order to figure out where to place some of the points for the sleeve cap guidelines. Sometimes when drafting a pattern, you need to draw the long leg of a triangle at a certain length. On paper, you just slide around the ruler until you get the length you are looking for. But because Pattern Editor won’t tell me how long a line is as I’m drawing it, I had to calculate in advance where the line’s endpoints would be – in this case, along the bicep guideline. Hence the math. Leftmost is my original dress sleeve. Middle shows the jacket sleeve sloper in progress, the rightmost (in teal) is the “finished” result. The long, gently sloping side of the curve is the back. It looks a bit odd to me, which makes me wonder if I’ve messed up some measurements somewhere. But, I’m just going to sew it up in muslin and see what happens. The shirt design isn’t done yet, so I don’t know exactly what I want to do in terms of detailing. I am thinking of making a convertible collar rather than the traditional stand collar, again because it’s something new for me. As usual, David Coffin has an extensive treatment of the convertible collar in The Shirtmaking Workbook, including downloadable patterns so I plan to use this as a starting point. As for pockets, I like welt pockets on the outside of a jacket because they give a cleaner look, but I am leaning towards patch pockets. I can put the plaid on bias for the pockets and that will look interesting. I will probably challenge myself by putting a welt pocket on the inside lining of the shacket, but also because I know I would find it useful. I’ll have fitting photos of the jacket block. We’ll see how that crazy sleeve looks. And hopefully more on the shacket design. Everyone, enjoy your holiday shopping! See you soon. The sleeve draft you find a little curious is a result of shifting the sleeve seam from the underarm to the back of the arm. You can see this on page 157 of the new edition of my book “How to Make Sewing Patterns.” The one concern I would have for that draft is that there doesn’t look to be enough on a dip in the underarm area. If I were you I’d just try sewing the top of the sleeve when you do your muslin. Leave the underarm area unsewn so you can see how the rest fits. The CAD program I use has extensive measurement capabilities as well as great editing functions. It is a general CAD program not specifically for clothes. While I created all my fashion doll patterns using this software, I have never tried scanning in an image. When you get to the tailoring process, my favorite book is Clarence Poulin’s. Excellent instructions if currently a little pricey. Lots of hand stitching and shaping the fabric. But fantastic results. Yes, the math was to get around a limitation of my software, which is a CAD application specifically designed for clothes. It does have extensive measurement capabilities – I can select any part of a curve, or indeed any group of lines and curves, and get a precise measurement in inches down to three decimal places – way more precise than I would ever need. But it is a temperamental program at times. 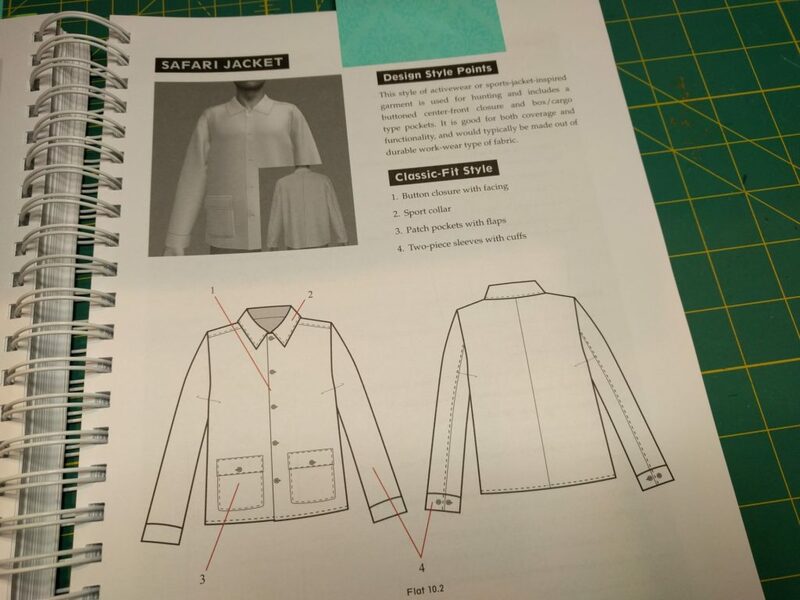 The Safari Jacket in the patternmaking book does have a two-piece sleeve pattern, but it looks like it has a seam underneath as well as on the back of the sleeve. I was planning to make my sleeve pretty much like a standard shirt sleeve. I’ll take your advice on sewing up the muslin, thanks! I have the Roberto Cabrera tailoring book, which everyone seems to mention, but I have not seen the Clarence Poulin book before. Thanks for the recommendation. I own the Cabrera books and believe I have a Poulin PDF. The Cutter and Tailor forum lists some recommended books in its section for people teaching themselves. No one book has everything, but I would try to rely mainly on one book to avoid confusion. The book titled something like tailoring the perfect jacket has good photos. One other thing: All the pattern makers I know who use software like Gerber learned to draft by hand first. I once asked a professional if I couldn’t just learn to draft on a computer. She said it wouldn’t make sense without the hand drafting background. I do have experience hand drafting; I spent basically a year doing hand pattern work trying to fit pants, and I’ve taken an in-person course in draping and patternmaking from a pro instructor. I’ve drafted a couple sleeves with paper and pencil before I did this one on the computer. A word of caution about using computer software to draft patterns. 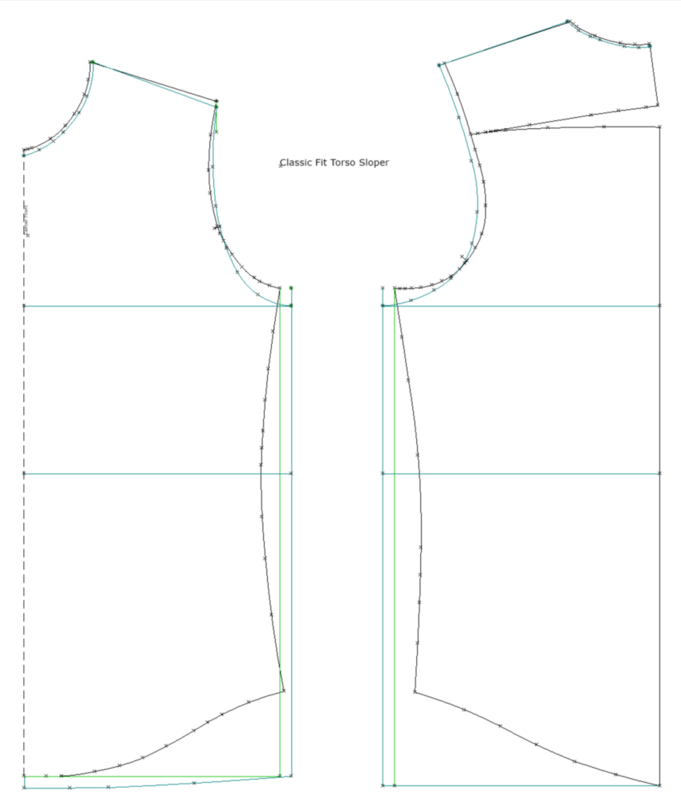 I was approached by one of the major manufacturers of a CAD system for custom sewers who wanted to alter their software to work with my patternmaking instructions. The most important issue for me is to be able to adjust a pattern based on the fit of a specific body. This software did not allow for the fine tuning of a pattern for a precise fit–particularly curves. I have used the very nice generic DeltaCAD system to create patterns for fashion dolls. So I know the potential is possible. But if you are considering using a CAD system, definitely check whether it allows you to fine tune a pattern. Granted I have not used the CAD for the RTW industry. But when I checked it was extremely expensive and has features I have no need for. It may be time for me to write a detailed review of the software I’m using, Wild Ginger’s Pattern Master. 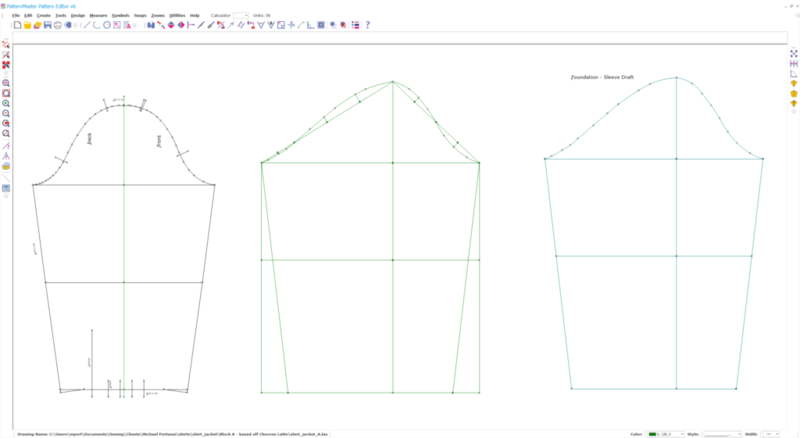 Pattern Master does offer to auto-draft patterns based on measurements, but it has a separate module called “Pattern Editor” which is a CAD program designed to edit pattern drawings. Pattern Editor gives you full control over the lines and curves in the pattern, and in fact you can draft a pattern from scratch here the way you would in a non-sewing digital app like Illustrator. Compared to a non-sewing app, Pattern Editor has features designed for sewing patterns – for example, it has built-in support for moving darts or slashing/spreading, and it’s easy to add seam allowances. Compared to pencil and paper, the process you follow is very different and it is useful to know flat-pattern drafting on paper so that you can understand what the digital tools in Pattern Editor are trying to accomplish. Thanks to your book, and the other instruction I have received, I understand Pattern Editor well enough to be productive in it. Looking at this pattern drafting book and yours more carefully, I’m not sure what they’re trying to accomplish with the sleeve. Their method of producing the back seam is to simply slash up the back, parallel to the underarm seam. The method you present on page 157 of your book is more sophisticated. I’m going to sew up what I have and see what comes of it. You’re gonna love having a shacket. The weather in the Northeast has been quite mild, so I’ve been wearing mine a lot. Yours should be extra warm with the fleece interlining. Looking forward to watching your progress. I totally understand wanting to save money on an experiment, but I would not use plaid. It complicates things too much. I assume you’re first making a muslin in muslin. Polyester can be awful to work with; use a new, appropriately-sized needle and you may need to use a press cloth at all times on both sides if your iron is too hot. I’ve taken tailoring classes at FIT. We use wool, because tailoring is as much about pressing and molding as sewing. Wool also is more forgiving: people with little experience use soft flannels and tweeds. In the introductory men’s tailoring class, we made a high-end pair of wool trousers that was partially lined with Bemberg and had a lot of hand stitching. In the intro ladies’ tailoring class we made two wool skirts, one lined, while the other had a Hong Kong seams. I hear you on the polyester; it might well end up being difficult to work with. We’ll see. But I did want to say that this project isn’t an attempt to make a tailored garment. I deliberately chose a shirtjacket so I could skip all of the internal structure, padstitching, and iron shaping. I’m basically making a shirt with a lining. I haven’t done linings before, but the shirt part is something I’ve done before and am familiar with. Yes, it would be easier if I weren’t working with plaids, but I also have prior experience working with plaid fabrics.